Cash Cave has an animal theme with a special focus on bears. Think Yogi bear not eating your sandwiches just paying you some nice wins. The bears in this slot game reside inside a fiery looking cave, well to state the obvious one can only assume that this is the cash cave referred to in the game’s title, To start one’s adventure in this online slot machine, players simply have to set in motion the game’s five reels that come with 100 paylines of pure Ainsworth fun. The background to this online slot machine is covered by a purple and black colour. The reel section is covered by a gold colour and it looks the part very nicely. 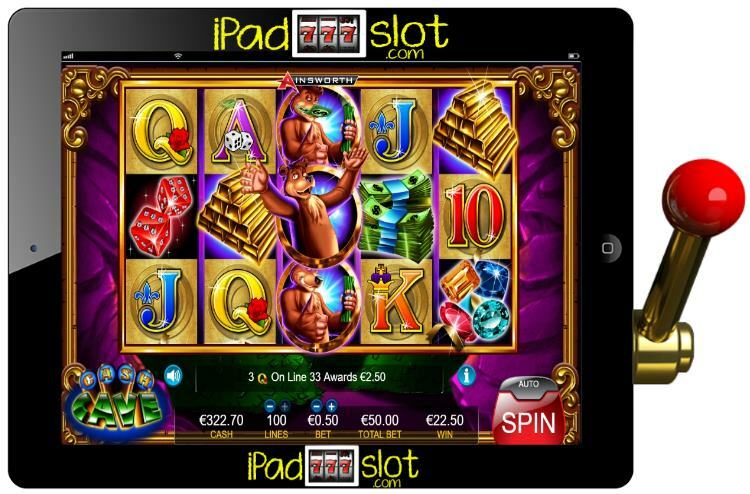 When spinning the reels of Cash Cave slot, players can expect to encounter the Cash Cave game logo icon, a dollar sign, gold bars, stacks of cash, dice, precious gems and traditional card symbols. Cash Cave Game Logo Icon: The highest paying icon in this game is the Cash Cave game logo icon. For matching five of these the player wins 100 coins, for matching four of these the player wins 10 coins and for matching three of these the player wins 2 coins. Dollar Sign: The second highest paying icon in the game is the Dollar sign. For matching five of these the player wins 2 coins, for matching four of these the player wins 1 coin and for matching three of these the player wins 0.20 coins. Gold Bars and Stacks of Cash: The third highest paying symbols are the gold bars and stacks of cash. For matching five of the same kind the player wins 1.50 coins, for matching four of the same kind the player wins 0.80 coins and for matching three of the same kind the player wins 0.20 coins. Dice and Precious Gems: The fourth highest paying icons are the dice and precious gems. For matching five of the same kind the player wins 1 coin, for matching four of the same kind the player wins 0.60 coins and for matching three of the same kind the player wins 0.05 coins. Traditional Card Symbols: The traditional poker symbols pay the lowest in this game. For matching five of the same kind the player wins up to 0.75 coins, for matching four of the same kind the player wins up to 0.20 coins and for matching three of the same kind the player wins 0.05 coins. 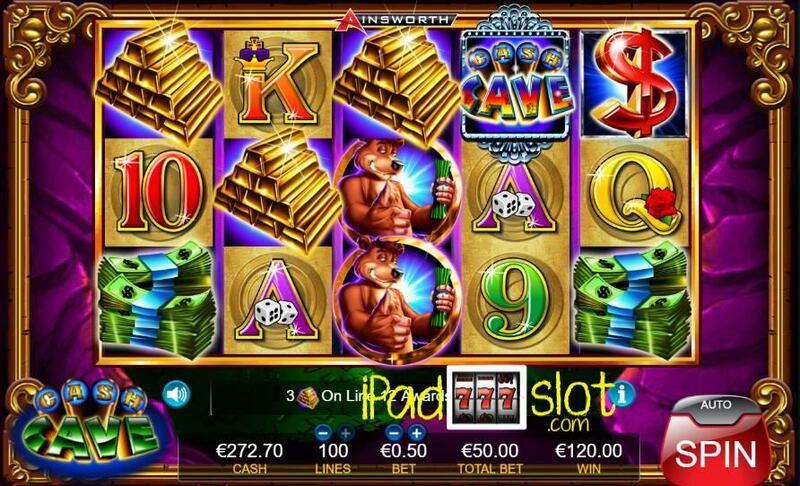 Wild: The wild symbol in this online slot game is represented by the bear. Scatter: The scatter symbol in this game is represented by the Cash Cave game logo icon. Landing three or more scatter symbols during the base game will help the player to trigger the Free Spins Feature. 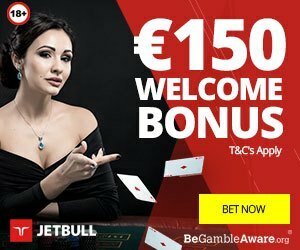 When triggered, the player gets 10 free spins. Three or more scatters will not retrigger additional free spins but will help the player to trigger another bonus round as seen below. A 2x multiplier is initially awarded to the player for the first winning combination n this feature but this will increase as the player lands more winning combinations. Landing three or more scatter symbols during the Free Spins Feature will see the player triggering the Cash Cave Feature. 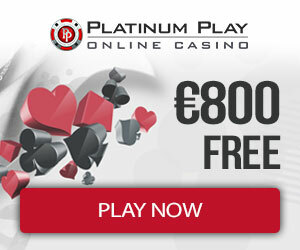 The player receives five free spins. However, the beauty of this feature is that when the player lands a wild combination, they receive an 8x bonus multiplier – how great is that! 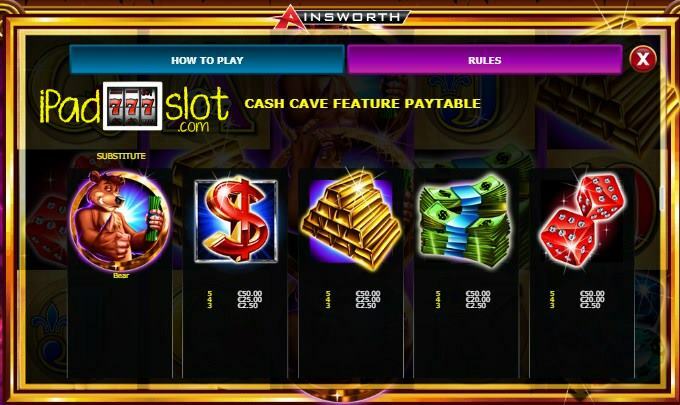 Cash Cave from Ainsworth is a pretty interesting slot game to play overall. 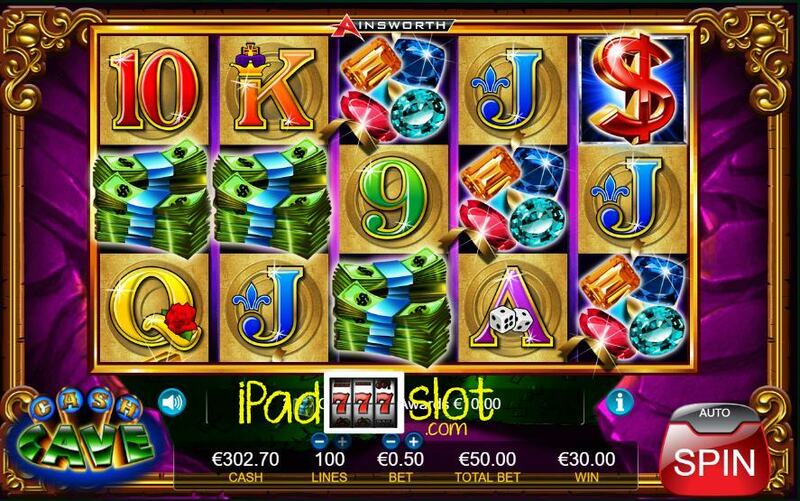 The RTP of this slot machine game stands at 94.04 percent (may change). 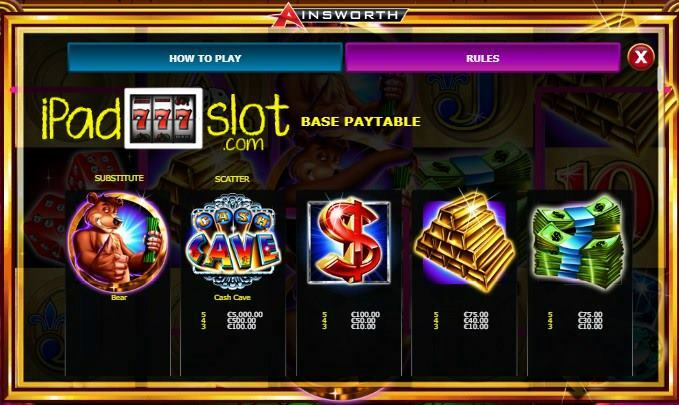 Out of a 10 point rating, this slot game gets a 7 point rating in our game guide.